We usually have Thanksgiving dinner at my in-laws and my side of the family comes too they all like each other so it works out really well. But this year there’s some construction going on so I think the plan is to have it at my house which I’m totally excited for. Besides in college I’ve never done Thanksgiving so I’ve been trying to think of some little details to make it special. 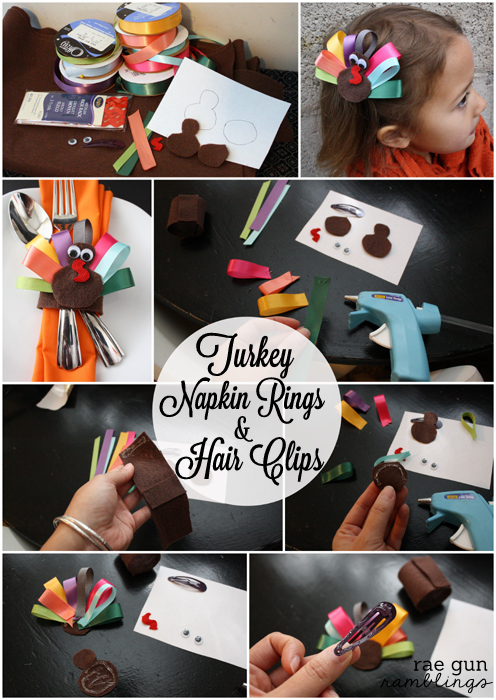 When I first thought of these Turkey napkin rings that also double as turkey hair clips I was thinking it would just be for the kids table but after both my sister and mom told me they wanted their own I think I just might have to do them for all the place settings. Luckily this project is SO quick, inexpensive, and easy that’s no problem at all. You can find all the supplies at your local Jo-Ann Fabric and Craft stores and if you’re like me you might actually have a lot of the supplies on hand. With the use of my trusty glue gun this project took me only about 10 minutes. Cut your napkin ring pieces. One piece 5 x 2 inches and another piece 1 x 2 inches. Draw a line of glue along both short ends of the the small piece and stick to the middle of the long piece. Then draw a line of glue along one of the short ends of the long piece and attach it to the other end to form a ring. 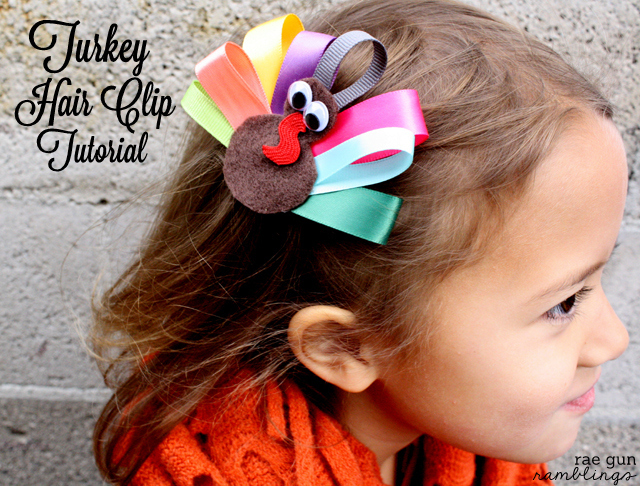 make sure that your small piece is on the outside of the ring this is how you will attach the turkey clip. Cut out a turkey body piece and a second round piece slightly smaller than the bottom circle of the turkey. 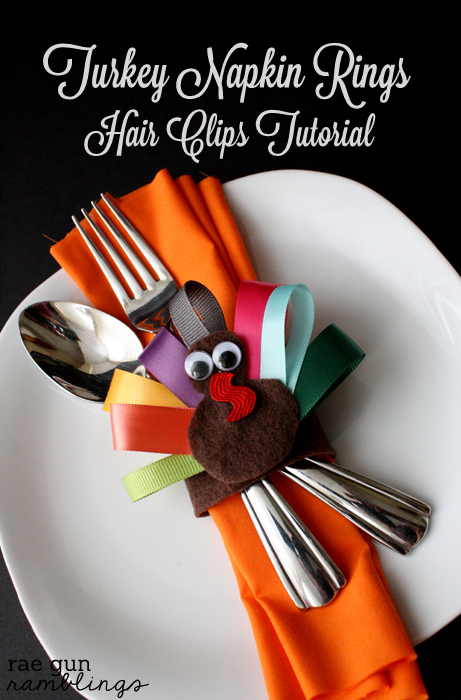 Fold your ribbons in half with the right sides out and glue the ends to form the feathers. Draw a half circle of glue on the back (round) piece of felt and attach the “feathers” add more glue as needed. I had to do a couple layers. Then add glue to the bottom round part of the front felt piece and place over the ribbons. Run your piece of rick rack over a flame to seal the edges and then glue on the eyes and rick rack. What’s that gobbly thing called again? 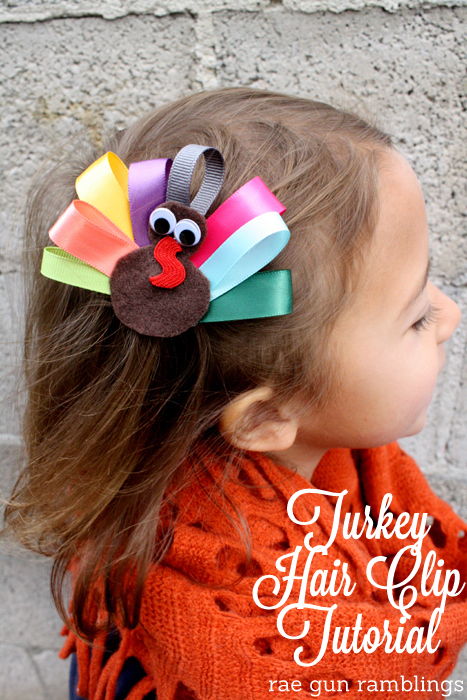 Finally add some glue to the top of the the hair clip and attach to the back of the turkey. Find a cute head and clip it on for a fun playful ‘do. 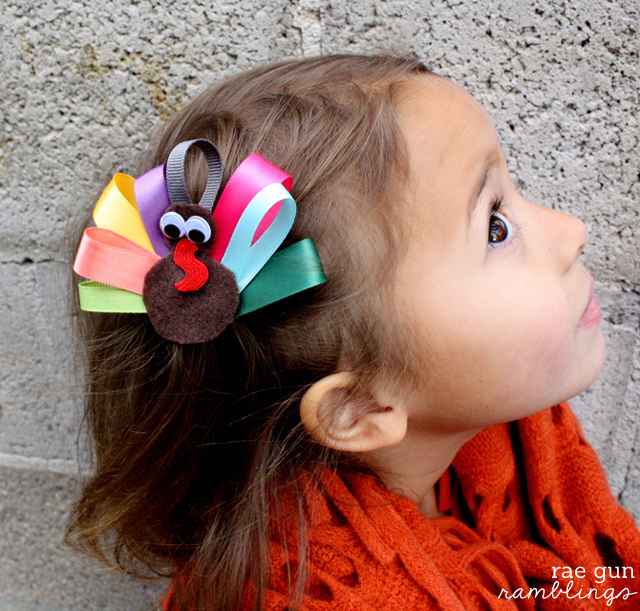 Or if you are making it for the men-folk or mini men-folk you can use a pinback instead of a flip clip and it can be a cute turkey pin. To use it as a napkin ring simply slide the clip through the opening formed by the little piece of felt on the napkin ring and you’re good to go. Not only do you have a festive decoration but your guest have something to take home. For more festive craft ideas be sure to check out the Jo-Ann craft catalog and all the great inspiration at the Celebrate the Seasons website. For extra savings be sure to print out this coupon for 50% off a regular priced item! These are ADORABLE! Pinning! Thanks! This is so cute!!!! Double duty makes it even better. Right!? As much as I love napkin rings I really wanted something that would be used for more than just a day. Oh my goodness, these are adorable! I have tons of ribbon scraps that would be perfect! This is adorable!!! I just love this project – pinned! I love that it is cute AND has a function. Very smart! So creative! Super Cute!!! Love it and pinned it! Thanks for the coupon too! 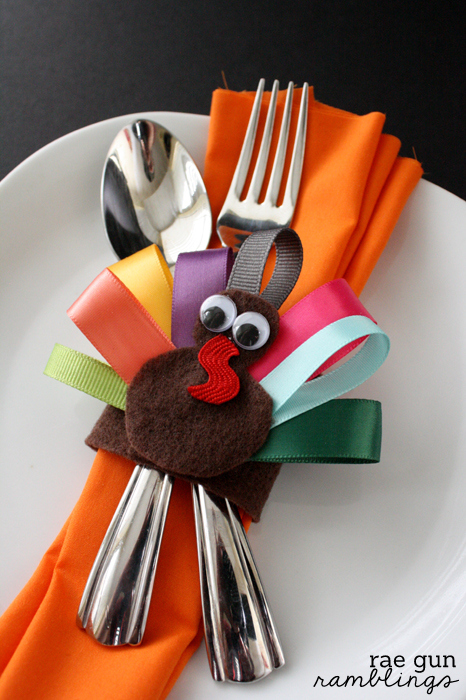 I love this turkey as a napkin ring. Cute idea. You are a genius, lady! These are darling. What a good idea! Too cute! My grand daughter would look extra cute wearing that turkey! There is one word for this project…..ADORABLE!!! It is super cute! I gave it a shout out so hopefully more people will stop by and see it! shopping options, such as price, color, size, brand, new arrival, designer, and many others. can probably find good values while still getting quality clothing. Oooh, this is cute! 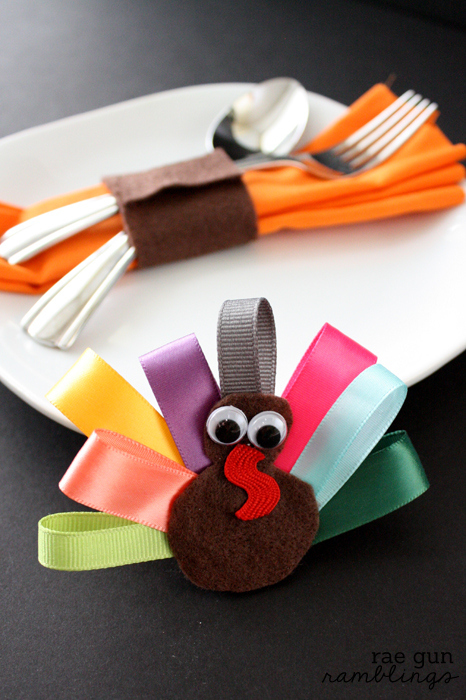 My kids would love to help me make these and put them around the table for our big Thanksgiving dinner! Pinned! This is an awesome craft! I love how it’s the same design used in different ways. I love them both! What a cute idea! I love crafts that aren’t too difficult because I’m not the craftiest! Love this! Aww, that’s so darn cute! I’m gonna file this away for future grandkids. Hi Marissa – these little turkeys are adorable! Visiting from Flamingo Toes and pinned! Have a happy week! Thanks I hope they love them! Cute idea! Thanks for sharing on Idea Box.